It's a little like camping in the backyard. But cooler. In my experience, camping with young children can go one of two ways: relatively well -- or really, really badly. 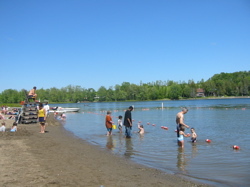 Thankfully, Thompson's Lake State Park, only about 20 minutes away from Albany, is a great place to take the kids camping. And if the kids (or you, for that matter) decide they've had enough of camping, you can all be back home and in time for bed. So, Thompson's Lake has location going for it -- but there are plenty of others reasons to check it out. First, the campground is reallllly family friendly. There's a lake, beach, playground and campsites that are just wooded enough to make you feel like you're roughing it -- but enough indoor plumbing to assure you that you are not. Campsites 1-52 are on a loop closer to the beach and playground, and consequently more active, with children and families everywhere. We chose to stay on one of the sites on the perimeter which are quieter, woodsier, and popular with younger couples and more experienced campers who prefer a less chaotic camping adventure (I am sure they were thrilled when our kids were up at 5:30 am). 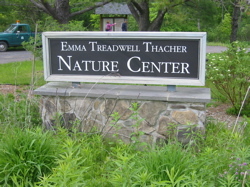 The Emma Treadwell Thacher Nature Center is a ten minute drive from the campground, but literally a two minute walk from the Thompson's Lake beach. It's a great place to do some bird watching, see amphibians, go on hikes... you know, nature-related stuff. 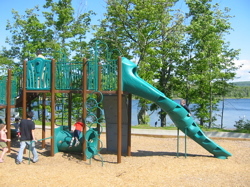 There are also plenty of activities for children. (puppets, crafts, nature quizzes, etc...). Our visit there went much longer than we had originally anticipated. Even if you and camping don't really get along so much, the short drive, beach, and scenic views still make this an easy and fun day trip out of Albany. This information is very helpful! I have two young kids, and I will definitely take your advice to heart for my camping plans this summer. Thanks! I love Thompsons Lake State Park! I love that you can rent a rowboat here for $20/day! I actually got engaged on a rented rowboat at Thompsons Lake about 3 weeks ago... so I am a little biased. Do not go to Thompsons Lake State Park if you are someone who is trying to have a good time with friends. I organized a get together with old friends and we decided to try Thompson Lake. Not only were the campsites and beach small, there were no grills to use at the day use area which made hanging out there difficult. Our site had things left from the previous occupants that were not cleaned up (beer cans, rope, dog poop). The worst part, however, was the staff. Aside from the ladies working at the check-in, the staff was absolutely ridiculous. Starting around 8:30 am, the rangers do their patrols and monitor the campers around the grounds. From the start, our group was monitored very closely. Quiet hours are from 10 pm to 8 am. If you are a camper who likes to chat by the fire, GO SOMEWHERE ELSE. At 10:18 pm, we were told to quiet down. On Friday night alone, my group was harassed by armed patrols on three different occasions. I assure you that we were doing nothing more than sitting around a campfire talking. Somehow, we made it through the night without them kicking us out. Saturday morning, at 8:15 am, our site was visited by a park ranger and sheriff in which they basically told us that we would be closely monitored and that we were on "thin ice." We had several conversations with other camping groups who had similar issues as we did. Others nearby commented that they either had not heard us or were frustrated with the 'security' measures at the campground. I have been camping all over NY State for over 20 years with family and friends. I have never had a problem at any other campground. This was the first time I was ever made to feel like a criminal. I will never be using those facilities again, nor would I ever recommend anyone else visit this park. If you want to enjoy yourself and not worry if you're whispering too loudly, try Moreau State Park. We also have so far had a poor experience here at Thompsons Lake. First of all, we reserved two sites for our friends. Both were given a very hard time at check in because the staff was not aware that the primary occupant was listed in a different spot from the actual purchaser of the site. One friend had called ahead and was told it was "impossible" that I had reserved his site ahead of time and forced him to pay for a different site. I had to show my confirmation papers to three different people before they finally would allow our friends to move to our site but they would NOT refund the extra site out friends were made to pay for! As we were camping we saw police and rangers everywhere which struck all of us as strange since we have never seen such a presence at any other NYS campground (and we have been all over)! They set up a "trap" of sorts where an officer parked on someone's occupied site and was yelling at people who drove the wrong way down the road. Several got tickets and the cops were yelling and getting in people's faces. Our friends rented a paddleboat for the day which the sign and paperwork stated $25 for the day. They used it for an hour around noon then at 6pm myself and another friend used it for an hour (boat return is 8pm). Our poor friends had a ranger show up on their campsite demanding to know where the boat was at 7:50pm and told them they had to pay $80 for the 8 hours of use. Our friends were floored and told them this was NOT in the paperwork anywhere to which the ranger said it was a $25 deposit plus an hourly rate. When our friends went to the office to complain the manager said he had no idea what they were talking about and that it was only $25 for the entire day. Lastly, we took our bikes out tonight for a ride, with lights on them. Since two of us were waking the bike riders were going quite slowly. We had two armed patrols following us who suddenly turned on the lights and very harshly said "You can't ride bikes after dark!" We asked if they were serious as we have never been told this by any other campground and have been to several who have their patrols ride bikes at night. The officers repeated themselves and told us bikes cannot be ridden after dusk for our own safety and proceeded to follow us back to the campsite to make sure we did not get back on them. This was not listed anywhere in the park rule sheet we had, but when I reviewed it again I saw in fine print that a complete rule book was available at the office. We haven't left yet and while we like the area we will not be back. Prison style management and inept staff left a bad taste in our mouth, which is unfortunate. 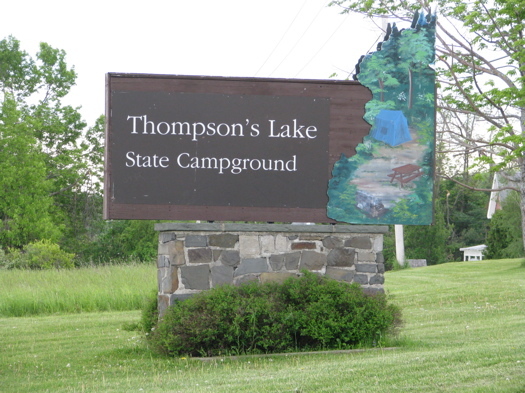 Are there still camping cabins at Thompson's Lake, Thacher Park? I ask because my great grand dad and my father and the family camped in a Cabin there in 1944.